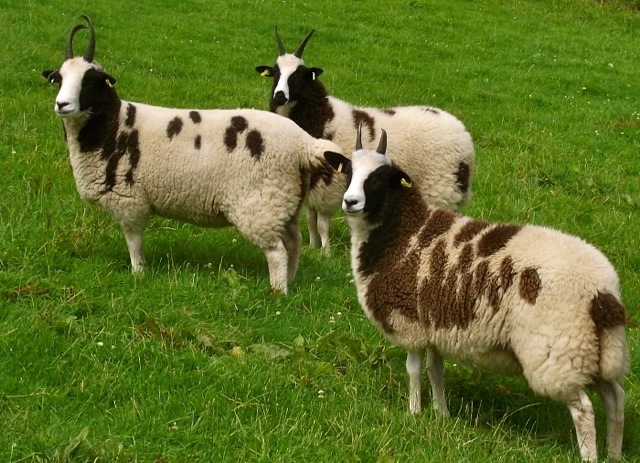 The Jacob sheep is an alert, active sheep being upstanding and deep bodied, white with well-defined black patches. The head and neck are generally black with a white blaze on the face extending down the chest. Both sexes are horned. The head should be clear of wool forward of the horns. All sheep should have a clear white blaze. A symmetrical blaze with even black cheeks is preferred. Black ears preferred. In adult sheep, a pink nose in conjunction with a broad white face is undesirable . A dark nose is preferred. Dark bold eyes are preferred with no tendency to split eye-lid deformity. Ewes should have a fine feminine appearance, whilst rams should be thicker set and masculine. Both shall be correct in the mouth. Jacob sheep are always horned, with either two or four in number. Where there are four, the top pair should grow upward from the top of the head and have no forward growing tendencies. There should preferably be space between the top and lower horns. Where there are just two horns there should preferably be space between the roots of the horns at the crown of the head, and grow so as to leave space between horn and cheek. Black horns are preferred. Horns should at all times give the animal freedom from injury and comfort when feeding. The back should be straight, level from the base of the neck to the setting on the tail, which should be broad. The tail should be set well up on the chine with well-developed thighs and well-sprung ribs to form a good bottom line. The neck should be strong, of medium length and well set on the shoulders. Legs are medium boned and of medium length, clear of wool below the knee and hock. Legs should preferably be white with little or no black. The fleece is of a medium quality, white with well-defined black patches. It is preferred that the skin beneath the white wool be pink, and black beneath the dark wool. There should be little or no kemp. Mottled wool and skin is undesirable.